Just in time for today’s reveal, there’s a fresh bunch of rumors. Some new code fragments suggest that Apple may be enabling a form of App rental system–possibly letting users “test” apps on a short-term basis to either try them out, or to access libraries of information and so on. Meanwhile Sprint is said to have entered into a $20 billion deal to sell iPhones over the next four years, and the accord may involve Sprint getting exclusive access to the still-rumored slim, tapered iPhone 5 design instead of the iPhone 4S. With suggestions that many UK networks seem to be getting the device, this could imply that Sprint-Apple is the new AT&T-Apple in the U.S.
Apple’s also expected to reveal Newsstand today–its magazine and newspaper equivalent of the iBooks app, designed to enable easy access to subscription publications. We can expect a shortlist of publishers to join the game. 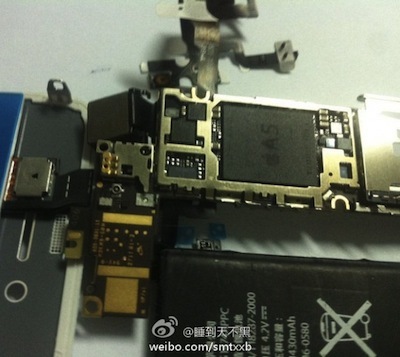 A number of leaked parts purporting to show the partly disassembled guts of an updated iPhone have surfaced online. Key among the components are what looks like an updated A5 Apple-brand ARM CPU and a slightly different battery to the iPhone 4 (helping differentiate the product from very similar earlier components). …with the conclusion being that the device, while possibly a highly polished prototype or in-field testbed, is more likely to be the iPhone 4S–what seems to be the launch name for the long-rumored iPhone “lite.” Most thinking currently has it that the iPhone 5 will be a new design, with a radically different shape (see “Cases” below) and the revamped 4S will break with Apple’s tradition of keeping the previous-gen iPhone on sale at reduced prices. The “4S” name has shown up in store inventories ahead of the product’s launch, and the JP Morgan posted a high-profile article that underlined Apple will be bringing two phone products to its upcoming launch event–not one. We’re expecting the 4S to be a slightly uprated iPhone 4, with an improved antenna (because other rumors suggest Apple’s ditching its rubber “bumper” case) and world-phone capabilities thanks to a GSM/CDMA chip from Broadcom. It’ll likely have smaller flash RAM, making it cheaper and maximizing the opportunities offered by iTunes-iCloud’s streaming options, and it’ll hopefully be a lot cheaper off-contract–because Apple’s had well over a year to optimize the production line–and thus aimed at developing markets as well as pre-pay fans. 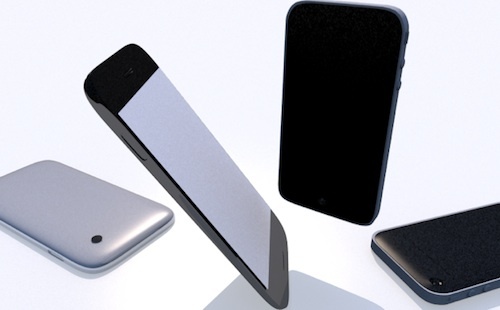 Few concrete details have leaked yet about the iPhone 5’s redesign–unsurprising perhaps, because after Gizmodogate and bearing in mind Apple’s hiring security experts, the firm is likely to be keeping the fifth iPhone really close to its chest. So far the most believeable description has come from ThisIsMyNext, which has the iPhone 5 in a fatter but much thinner front-to-back chassis, with a tapered profile and a larger screen that approaches the edges of the phone more than in the iPhone 4’s shape. This is the design that an increasing number of “leaked” cases from Eastern manufacturers agrees with–and while it’s not proof positive, these firms were pretty accurate before the launch of the last iPhone and iPad 2. Stepping on some theories that Apple’s abolishing the iPod Touch in favor of its low-price iPhone 4S, and also other rumors the iPod Touch would get a data-only SIM option like the iPad has, recent indications in terms of leaked info and components suggests that Apple’s updating the iPod Touch and keeping the design largely the same. There’s proof it’ll come in a white skin for the first time, like the iPhone does, but we may also expect an uptick in its internal power and storage. Other than this gentle tweak, it looks like Apple is paying less R&D time to what is, undeniably, an increasingly less important product in its stable. Speculation has increased this week about whether Apple will actually stump up one or two new phones when Tim Cook actually steps on stage in at Apple’s Oct. 4 press event. A Wedge Partners analyst has garnered much attention with very definite predictions that the only device Apple will reveal will be the “4S,” a device that’s essentially the iPhone 4 with cosmetic tweaks and uprated guts–much as the 3GS succeeded the 3G. The fact that little or no leaks of components or other data about the supposed redesigned iPhone 5 does, to some minds, confirm this to be true. But Al Gore let slip that “new iPhones” (quite definitely in the plural) will be released in October, and as an Apple board member he’s definitely a chap to know this fact. 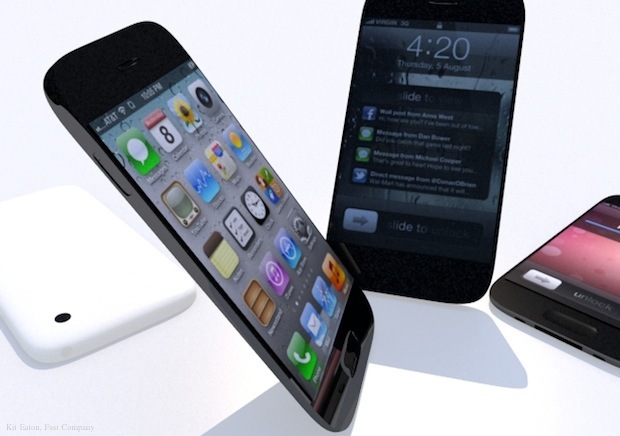 For the record, our money is on two devices–including the tapered-shape iPhone 5. It’s for a couple of reasons, including giving new CEO Tim Cook a big first launch product and the fact that in the weeks before the iPhone 4 arrived we knew precious little about it at all… if it wasn’t for Gizmodogate, we’d have been totally surprised at its launch. Apple has, according to Digitimes, increased its demand for components from Japanese firms like Toshiba and Elpida Memory–specifically buying quantities of DRAM and NAND flash memory and storage. It’s another move away from Samsung, after earlier reports that Apple was planning future production runs of its AX line of CPUs for iPhones, Apple TVs, iPod Touches, and iPads to TSMC–representing potentially billions in revenue. Samsung is aggressively pursuing Apple on IP violations in courts around the world, even as Apple wins several court rulings that Samsung is merely cloning its designs, and recently a previous high-ranking Samsung employee revealed that he leaked information about Apple’s iPad to analysts and hedge fund managers before it was launched. Apple is one of Samsung’s largest business-to-business customers, but the relationship seems to have soured. A latent production line glitch, seemingly involving bubbles forming in the LCD-touchscreen assembly for components rolling off the Wintek line, is now reported as delaying the iPhone 5 slightly, or at least curtailing the number of devices that’ll be available for sales at its launch. Wintek has vigorously denied the rumor, noting all its products are going to ship on schedule. Wintek’s response is what gives us confidence here: The firm may be expected to pull a mysterious “no comment” response if it were trying to cover up a real issue with such a high profile supply part for such a high profile customer, also toeing the same PR-control line Apple obeys. But we also know Apple’s had issues with screens before–including an initially worrying, but later inconsequential “yellowing” problem with iPhone 4 screens. It’s hard to say how badly production may be affected, but it’s plausible that the issue may be less significant this time around, as Apple’s thought to have engaged a wider range of suppliers for this new phone. A new rumor from Poland suggests that Apple is imminently about to expand its iTunes Music Store offering to 10 more European nations, including Poland, Hungary, and the Czech Republic. This will eat into the 12 EU nations that don’t yet sport iTunes Music stores, due to the complex cross-border music licensing issues still prevalent in the Union. The move increases the number of nations offering iTunes music by nearly 50%, which is significant for Apple–and comes mere weeks before the new iPhone is expected to hit, bringing iOS5 and Apple’s cloud music/storage/streaming service iCloud with it. So Long, Farewell, Auf Wiedersehen, Adieu To iPod? Apple is poised to overhaul its iPod lineup in perhaps the biggest way since the device first arrived on the scene a decade ago. Sources connected to Apple, with knowledge of its plans, have hinted to TUAW that the iPod Classic and the Shuffle will actually be ditched from the product inventory at Apple’s upcoming October 4th iPhone press event. This will leave the iPod Nano as the entry-level device, and the iPod Touch will get a few cosmetic changes. The upshot will be a simplified product list, and every iPod will now have a touchscreen like the iPhone and iPad. This thinking aligns nicely with some thinking we’ve done at Fast Company, and could be the first move toward shutting the iPod brand down for good. A credible rumor suggests that the Apple TV will be hitting seven new EU nations (Belgium, Denmark, Finland, Luxembourg, the Netherlands, Norway, Sweden) on October 4th. That timing is interesting, as it aligns with Apple’s press event, and has ignited speculation that Apple is primed to announce new content deals for iTunes in more nations as part of its (presumed) combined iPhone/iOS5/iCloud reveals. Leaks from inside Apple’s inventory system suggest that the next iPhone will come in three sizes, not the two traditional ones: And rumors say the likely capacities are 16GB, 32GB, and a massive 64GB (matching the SSD on the entry-level MacBook Air). The rumor doesn’t discount that the sizes could be 6GB, 16GB, and 32GB–and iCloud and iTunes Match may be seen as Apple reducing the need for large capacity internal storage. But we do know a prototype iPhone was being tested with 64GB on-board storage. This is interesting–after an armload of leaks we’ve got some evidence, via Vodafone Germany, that Apple is retaining the iPhone 4 for 2011 and adding an 8GB model (this is its cheaper “lite” edition destined for pre-pay markets)…while the purported iPhone 5 is really the iPhone 4S. 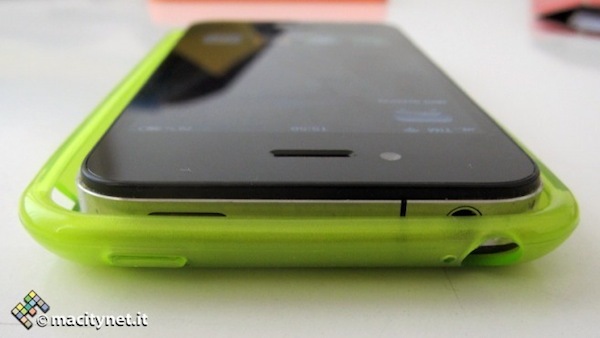 Anectodal evidence from elsewhere suggests that the 4S is more or less identical in design, just with uprated internals. So if you believe this one line of argument, then Apple’s not going to reveal the teardrop iPhone design at all tomorrow.